Jeffrey Welch's Blog: Can Dogs Eat Cucumbers? Cucumbers are actually considered both a fruit and a vegetable. Because cucumbers grow out of flowers and usually contain seeds, they meet the definition of a fruit. But cucumbers are also considered to be vegetables because they aren’t sweet in taste. Cucumbers are a very popular snack because they’re free from fat, saturated fat, sodium and cholesterol, and they’re low in calories. In a recent survey, cucumbers were the seventh most popular vegetable purchased in the United States. Can dogs eat cucumbers? Photography ©sommail | iStock / Getty Images Plus. To best answer the question, Can dogs eat cucumbers? we turned to a vet. “Cucumbers aren’t toxic to dogs, so if cucumber-loving owners want to share this low-fat snack with their pup, I give them a thumbs up!” advises Heather B. Loenser, DVM Senior Veterinary Officer for the American Animal Hospital Association (AAHA). The next question after answering Can dogs eat cucumbers? is: Are cucumbers good for dogs? Great news! It turns out that cucumbers are a very healthy snack for both people and dogs. Cucumbers are a great low-fat, low-calorie treat that is especially good if you are concerned about your dog’s weight. 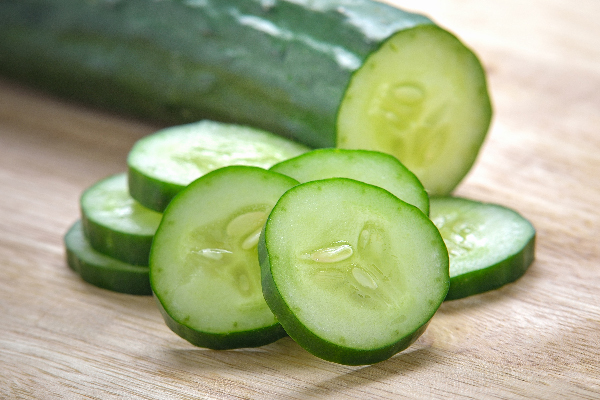 Cucumbers are high in phytonutrients and have antioxidant and anti-inflammatory benefits. What types of cucumbers can dogs eat? Slicing cucumbers are most frequently found for sale in grocery stores. They have a waxed skin for preservation, and are long, up to 9 inches in length with tapered ends. Pickling cucumbers are generally smaller and squatter and, as the name implies, used primarily for preserving — usually in vinegar, salt, sugar or water. Don’t share pickled cucumbers with dogs due to the added salt and sugar. How should you serve cucumbers to your dogs? Cucumbers are a very watery vegetable, so they’re a great way to provide your dog with extra boost of hydration — especially during the summer months. If your dogs (and you!) are active, cucumbers are easy to slice and carry with you on hikes or trips to the beach. In fact, I’ve already planted a lot of cucumber seeds to be sure I have enough for my salads and my dogs to snack on all summer long. Last year, my big dogs liked cucumbers so much that they even tried to pick them off the vine! Slices: The easiest way to share cucumbers with your dog is to slice and serve the cucumbers plain. Filling garnishes: If your dog is on a diet, add cucumbers to his dinner as a filling garnish to help him feel less hungry. Stuff cucumbers into your dog’s chew toy or food puzzle toy: Wedge cucumber spears into a food puzzle toy. Sassafras Lowrey is an award-winning author. Her novels have been honored by organizations ranging from the Lambda Literary Foundation to the American Library Association. Sassafras is a Certified Trick Dog Instructor and assists with dog agility classes. Sassafras lives and writes in Brooklyn with her partner, a senior Chihuahua mix, a rescued Shepherd mix and a Newfoundland puppy, along with two bossy cats and a semi-feral kitten. Learn more at sassafraslowrey.com. Thumbnail: Photography ©chris-mueller | iStock / Getty Images Plus. Almonds, Peanuts, Pistachios and Other Nuts? The post Can Dogs Eat Cucumbers? appeared first on Dogster.